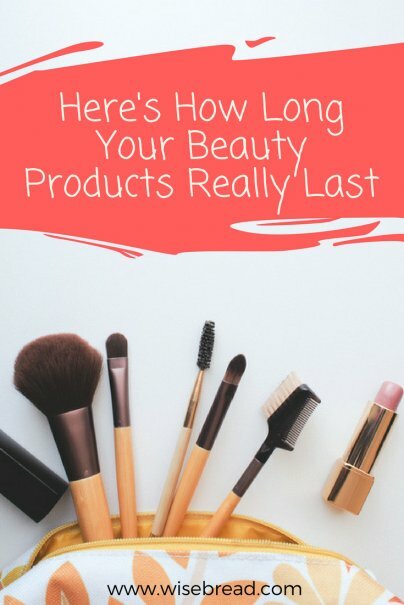 Do you know when your beauty products expire? It's important to keep track, because using spoiled cosmetics and skin care products can cause skin or eye problems. Some items are worse than others. For instance, using expired mascara can lead to staph infections, pinkeye, or eye irritations that can even affect your vision in rare cases. Expired items also lose their efficiency. Many professionals agree that you have to use about 50 percent more of an old or expired product for the same effect of a new one. They can become more difficult to apply, too, so it's best to just replace your beauty products once they have expired. In order to keep track of when your items expire, you need to know exactly where to look for the expiration date. Check the whole container: Expiration dates can be hard to find, so look all around the bottle, including on the bottom and sides of the container. If you don't see an expiration date, look for the little tub image, usually located on the back of the container toward the bottom. For certain cosmetics, the image may be on the exterior packaging that you usually throw away once you open the product. The tub has a number followed by an "M", which shows the number of months until the product expires. For instance, 12M means that the product will expire in 12 months. If you're not sure when your items are expected to expire, look for changes in smell, color, consistency, or effectiveness as a good determination that they may have spoiled. The following guidelines can provide a good estimate of when certain cosmetics will expire. Some beauty experts recommend tossing items more quickly than others, so these guidelines follow the general consensus. They stray toward later expiration dates so you don't have to waste any product unnecessarily. Some experts say lipstick can last one to two years, others say up to four years. What everyone agrees on is that once it starts to smells rancid, it's time to throw it out. If your lipstick has become dry or your lip gloss is extra sticky, it may also be time to throw it out. Makeup brushes can last forever if maintained well (see below for tips on how to care for them). If the little hairs start getting crunchy or falling out, it's time to replace the brush. Nail polish can last up to three years. If it starts to separate and won't fully mix up when you shake the bottle or if it gets gunky and doesn't provide a clean, smooth finish, it needs to be thrown out. Some experts say perfume is kaput after one to two, others say it can last as long as 10 years. The general consensus is that if it has thickened, changed color, or the scent starts to change or takes on the smell of alcohol, it's time to toss it. Cream-based or oil-based foundation, eye shadow, and blush is typically only good for 12–18 months. They tend to break down faster than powder-based cosmetics due to the moisture and oil content. Water-based foundation also expires quickly (six to 12 months) because water encourages bacteria growth. Conversely, powder makeup can be kept for two to three years because the dry texture inhibits bacterial growth. Permanent markers or small labels are your friend here. Mark each product with the date you bought it and the expiration date, if it’s not already printed on the product itself. Keep a monthly list of what is expiring for at least the current month and next month, so you know what needs to be used up soon. By keeping track of these "expiring-soon" products, you can try to use them up quickly, so you don't waste money on unused product. What can be kept past the date? If you really can’t part with your favorite beauty product, there might be hope for it yet. Some items can be kept past the expiration date (such as powder makeup) because bacteria can’t grow as quickly on the dry texture. Items such as perfume, nail polish, lipstick, and blush commonly last past the expiration date, but the performance and results might not be the same. Expiration dates for any item that touches your eyes or is made with a cream or oil base should be strictly adhered to in order to prevent skin or eye infections. If your skin is reacting badly to an item or the color, smell, or consistency has changed, it’s a good indication that the item is past its useful life.